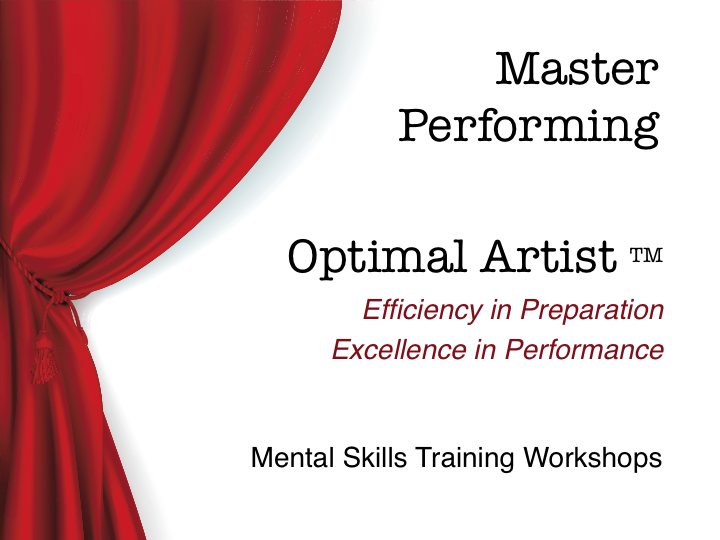 Master Performing begins with a 15-hour curriculum in which you will learn about the foundations and root causes of performance anxiety. You may choose Group or Private settings for these initial masterclasses. After the initial sessions, many performers continue with Follow-Up Coaching. In coaching one-on-one, skills are honed and tailored according to each individual artist’s performing strengths and needs. Do I Need Follow-Up Coaching Sessions? (No) You can learn a great deal solely by attending the masterclasses, where you will learn the basic foundations of the root causes of performance anxiety. After that, you will already be on your way to better performances. (Yes) Think of it this way: would you attend four masterclasses on How To Play The Piano and then book a recital date in Carnegie? Probably not. You have studied your artistic craft for years. You have taken weekly lessons, attended masterclasses, practiced for hours and hours, and given umpteen performances. Your artistic successes thus far did not come instantly. Mastering your mindset won’t come instantly, either; these skills will require diligence and practice. To inquire about and to schedule Follow-Up Coaching sessions, please Contact Master Performing.